Following this article https://buoctrenmay.com/2018/01/11/playing-with-sitecore-9-0-update-1-installation/comment-page-1/#comment-548 to install Sitecore, got this error on step 13, any idea? 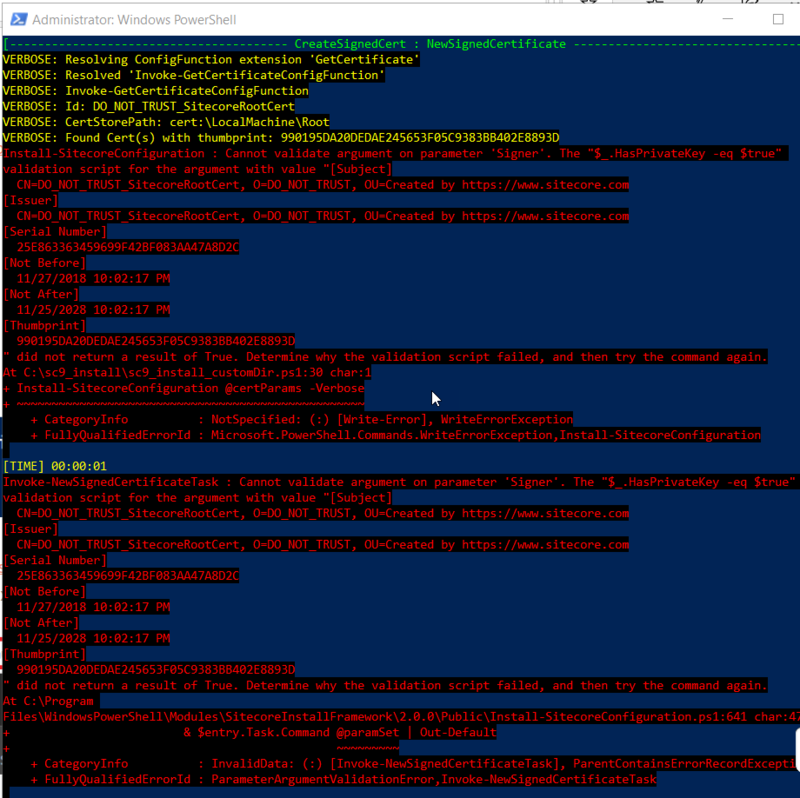 I have closed all active PowerShell sessions, deleted all DO_NOT_TRUST* certificates from all certificate store and C:\certificates. I have opened “xconnect-createcert.json” and changed the below line of code. Encountered the same exact error today. It looks like a new version of the SitecoreInstallFramework was published November 28th (version 2.0.0). It seems to break the process in some way. I solved this by uninstalling the framework and reinstalling with version 1.2.1. This can happen if you tried to install sitecore 9 in the past. Changing "RootCertFileName" default value in xconnet-createcert.json to, for example, SIF121Root, fixes the issue. Not the answer you're looking for? Browse other questions tagged sitecore-client sitecore-install-framework or ask your own question.